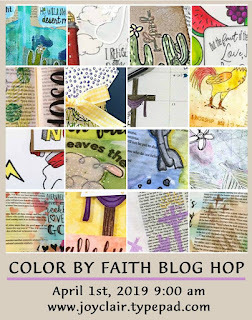 Hello friends, and welcome by my blog today as my teammates and I from Joy Clair Stamps showcase one of our lovely lines of stamps called Color By Faith. 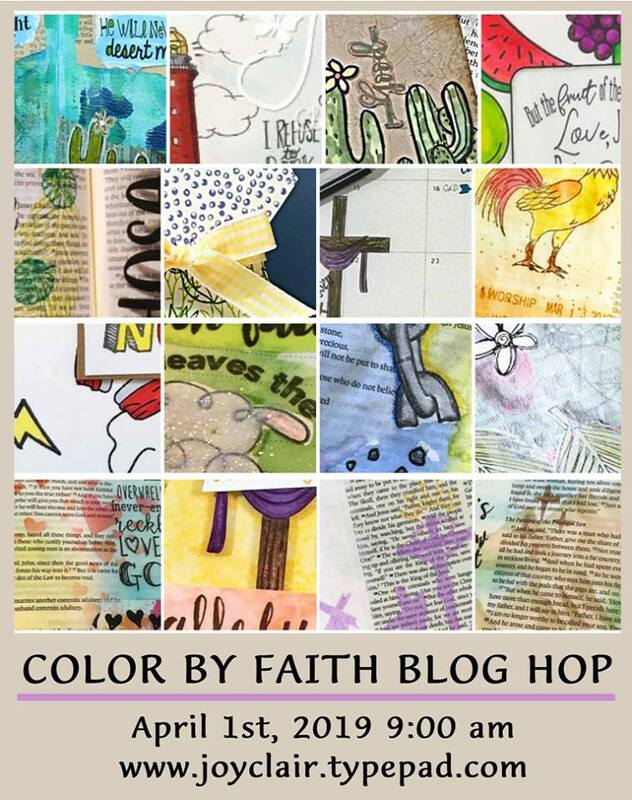 I had so much fun with my projects for today, and I know that you will also love ALL the stamps at Joy Clair including these wonderful Color By Faith stamp sets. 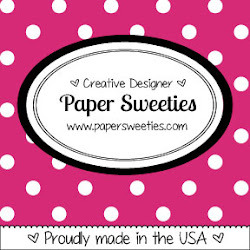 Let's celebrate with a BLOG HOP! 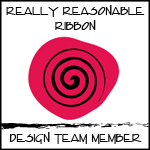 By hopping along and leaving a comment at each blog, you will be entered to win. You never know which DT Member's Blog the winning comment will come from; so we encourage you to comment on each stop along the way. First, I did some stamping in my old study Bible. Obviously, this is not a Bible that I actually use any longer. But I am putting it to good use by decorating it, and the verses I find each time I open it are blessing to me over and over again. 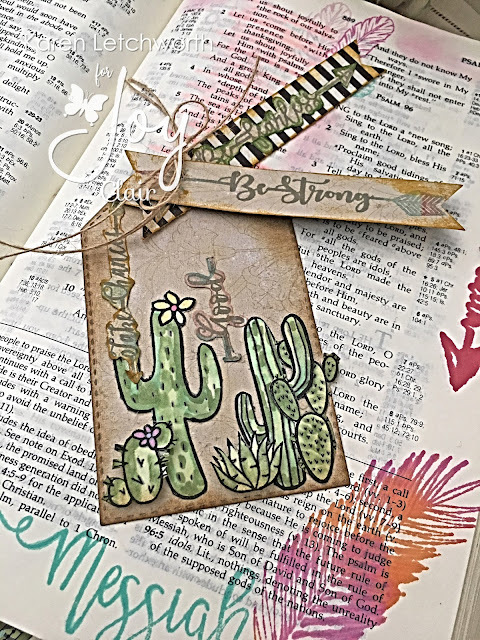 I stamped in the sidelines and bottom of my Bible pages using stamps found in the Unashamed Stamp Set, the Hosanna Stamp Set and the Inspirational Arrows Stamp Set. Coloring on Bible pages definitely has a learning curve. I just purchased some nice colored pencils to give that a try. Some inks seem to be simply too wet. 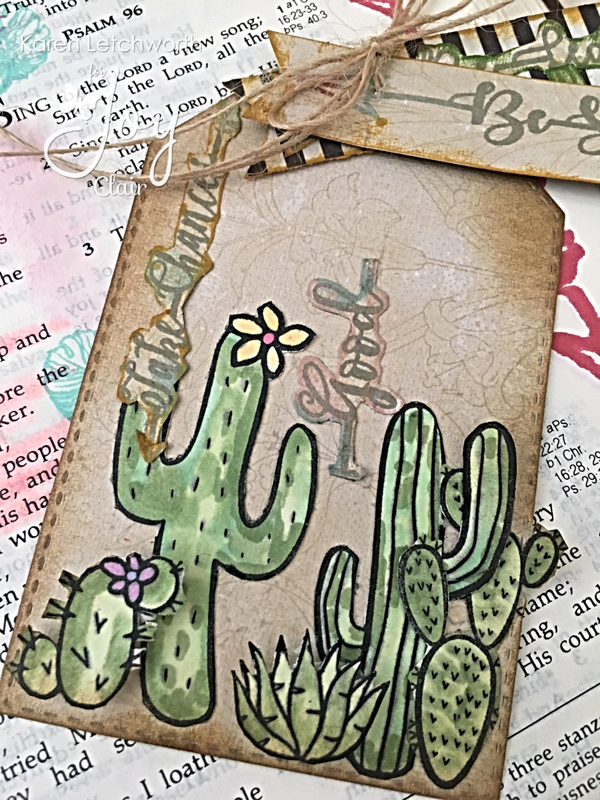 I also created a sweet tag that I stamped with all the amazing cactus found in the Blossom Stamp Set. These cactus are SO cute, and I have fun with this set every time I pull it out. I love the flowers in the cactus, and all the different fabulous shapes. They're SO much fun to color, too. Next, I added a couple of banners/strips that I stamped with different sentiments found in the Inspirational Arrows Stamp Set. I stamped some of these words (cut and pieced) to the tag itself, and others as the banners you see hanging from the tag. I tied them on with some natural burlap string. There's going to be lots of fabulous inspiration on this hop, and I hope you enjoy each stop along the way. 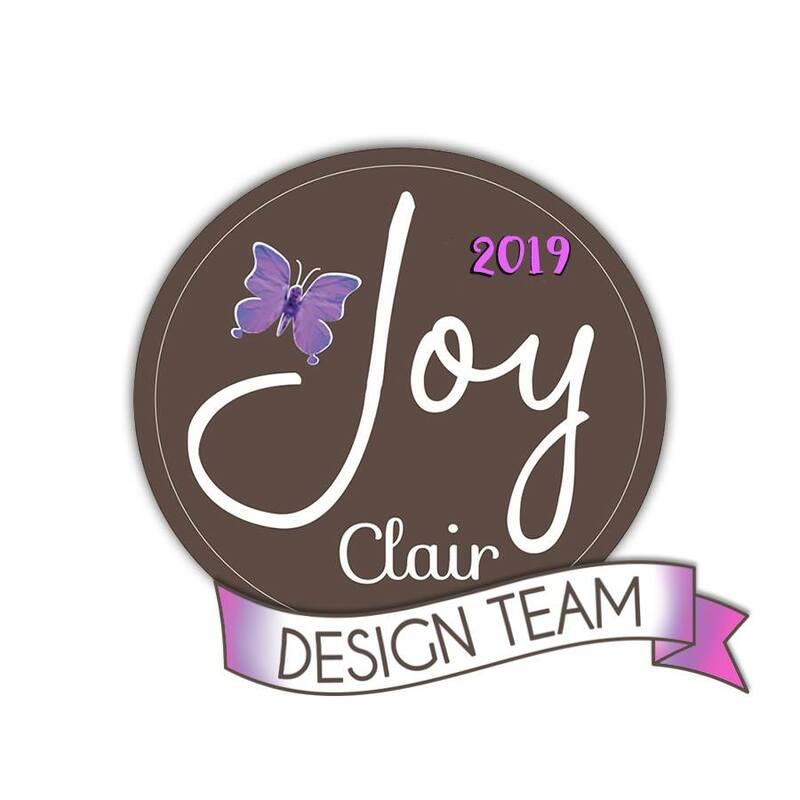 As I mentioned above, one lucky person will win a $25 Gift Certificate to Joy Clair Stamps, so be sure to leave everyone a comment and then leave one as well on the Joy Clair Blog letting us know what inspired you. The winner will be announced on the Joy Clair Blog on April 30. Thanks for stopping by, and happy hopping! 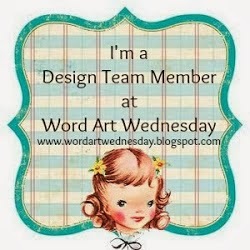 HI Karen - lovely Bible journaling and tag - I did a search for products that do not bleed through pages -did you know acrylic paints are fabulous as well as Gelatos - so much one can do with Bible Journaling - love your work - nice job! Have a blessed day! Gorgeous page and like that you use an old Bible. You have inspired me to do our old family Bible which I can give to my daughter in October for her wedding. Thank you so much for sharing this and the inspiration. I love your idea for stamping in an old Bible -- I don't own one of the fancy "journaling Bibles" and probably never will....but this, I could do! Love your tag as well -- such fun cactus stamps! Love what you did with the cactus set. I like seeing it paired with another set. Thanks for the inspiration. I love the Color By Faith stamps from Joy Clair. Your cactus are amazing, and I love that you used an older Bible for your journalling. 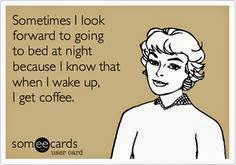 I will have to think about giving that a try. Thanks for the fabulous inspiration. I just love how you colored the cacti. Beautiful. The tag is great! What a pretty tag! I love the way you colored the cacti with several shades to create a great look! Great page. I like the cacti tag. Love the pages and sweet stamp set! Terrific tag!